Roughneck 12-in-1 Multi-Tool: Ideal for everyday use within industry, automotive and construction, or at home. 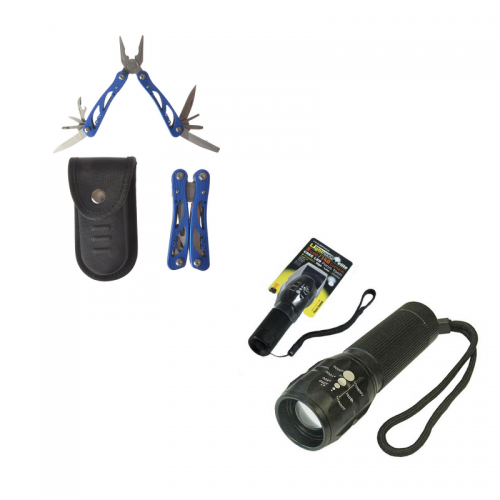 Includes universal pliers with serrated nose, wire cutter, saw, small and large knife, bottle opener, curve jaw plier, 3mm, 6mm and 8mm flared screwdrivers, Phillips 1 point screwdriver and mini file. Comes supplied with a handy pouch with a belt loop for convenient carriage. Lighthouse Elite Pocket Focus Torch 3 Watt: Produces 140 lumens of light, powered by just three AAA batteries uses the latest CREE LED technology to improve both brightness and run time, 8 hours from one set of batteries with over 100,000 hours of life from the LEDs body is shock and rain resistant and made from aluminium Fitted with a wrist strap and focus adjustment. Supplied with batteries.